10 Best Nose Rings We Spotted On Real Brides In 2017 - #Weddingz2017Rewind! 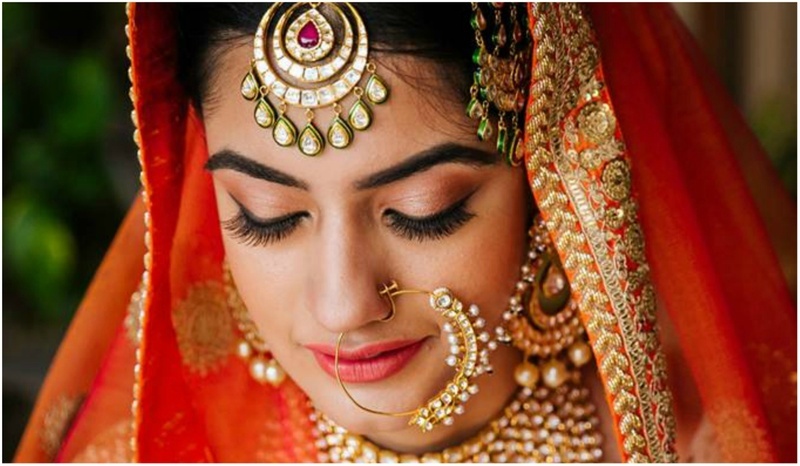 Wedding jewelry is an integral part of any Indian bride’s trousseau and there is no denying that every piece of jewelry adds its own appeal to the overall bridal look. However, the royal charm that a nath or a nose ring brings to your wedding look remains unparalleled. From the oversized dramatic naths to the petite nose rings, we did a round-up of the best and most trending nathanis we spotted this wedding season. These oversized nose rings, encrusted with stones are so classy and stylish all at the same time! If you have a little long nose, this nose ring is the perfect choice for you. A little on the heavier side, these nose rings are just apt if you want to go for a queen like grandeur! They have been trending for a long time and we say why won't they? They are elegant, classic and add a touch of class to your bridal look! This minimalistic nath with a thin string is a sure-fire way to add elegance while keeping it understated. How pretty are this elaborate nose rings with the intricate designs? We say these chunky large hoops are a timeless piece! A floral nath can be a perfect fashion piece for a bride’s D-day. The eruption of tiny flowers in vivid colours and patterns on your nose ring will definitely bloom up your fashion statement at your wedding. When it comes to that perfect blend of traditional and contemporary charm, nothing matches the elegance of kundan. These pretty and stunning kundan naths will add that much-needed drama to your wedding outfit. If an oversized nose ring is a trend spotted everywhere, these elaborate chains trends are also pretty exciting. This gorgeous bridal nose ring with intricate designs on the chain, is sure to be the talk of the town adding the glam-factor to your bridal look. Your wedding day is all yours and you can go as overbroad with your bridal look as you feel like (in a non-tack way of course). We are in love with this bride’s crystal, kundan and pearl encrusted nath with multiple strands. The nath is the wow-factor of the maharashtrian bride’s wedding look. This traditional nosepiece has pearls woven in a typical Paisley shape and has a white stone, diamonds or ruby in the center. Dramatic oversized vintage bridal nose rings are a rage this wedding season. With all of those elaborate nose rings included, this nose ring is by far the most elaborate and the heaviest nose ring design we have ever seen till date. The intricate designs and work in it combines glamour with tradition, giving the bride a stellar look. With our curated list of 11 best nose ring designs spotted on real brides in 2017 coming to an end, we hope it has helped you decide what look you wanna opt for your 2018 wedding!